13.1. Estimate the fraction of molecular volume to the actual volume occupied by oxygen gas at STP. Take the diameter of an oxygen molecule to be 3Å. 13.2. Molar volume is the volume occupied by 1 mol of any (ideal) gas at standard temperature and pressure (STP: 1 atmospheric pressure, 0 °C). Show that it is 22.4 litres. 13.3. Figure 13.8 shows plot of PV/T versus P for 1.00×10–3 kg of oxygen gas at two different temperatures. 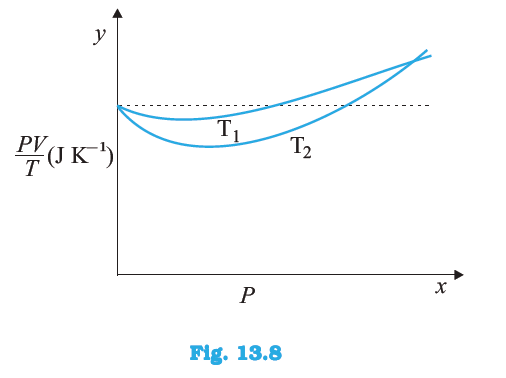 (a) The dotted plot in the graph signifies the ideal behaviour of the gas, i.e., the ratio PV/T is equal. 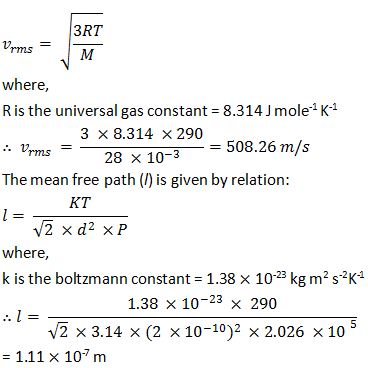 μR (μ is the number of moles and R is the universal gas constant) is a constant quality. It is not dependent on the pressure of the gas. (d) If we obtain similar plots for 1.00 × 10–3 kg of hydrogen, then we will not get the same value of PV/T at the point where the curves meet the y-axis. This is because the molecular mass of hydrogen (2.02 u) is different from that of oxygen (32.0 u). Hence, 6.3 × 10–5 kg of H2 will yield the same value of PV/T. 13.4. An oxygen cylinder of volume 30 litres has an initial gauge pressure of 15 atm and a temperature of 27 °C. After some oxygen is withdrawn from the cylinder, the gauge pressure drops to 11 atm and its temperature drops to 17 °C. 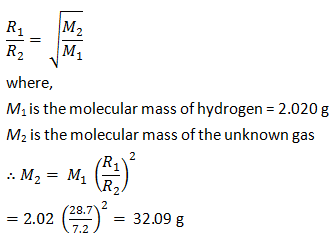 Estimate the mass of oxygen taken out of the cylinder (R = 8.31 J mol–1 K–1, molecular mass of O2 = 32μ). After some oxygen is withdrawn from the cylinder, the pressure and temperature reduces. 13.5. An air bubble of volume 1.0 cm3 rises from the bottom of a lake 40 m deep at a temperature of 12 °C. To what volume does it grow when it reaches the surface, which is at a temperature of 35 °C? 13.6. Estimate the total number of air molecules (inclusive of oxygen, nitrogen, water vapour and other constituents) in a room of capacity 25.0 m3 at a temperature of 27 °C and 1 atm pressure. 13.7. Estimate the average thermal energy of a helium atom at (i) room temperature (27 °C), (ii) the temperature on the surface of the Sun (6000 K), (iii) the temperature of 10 million Kelvin (the typical core temperature in the case of a star). Hence, the average thermal energy of a helium atom at room temperature (27°C) is 6.21 × 10–21 J. Hence, the average thermal energy of a helium atom on the surface of the sun is 1.241 × 10–19 J. Hence, the average thermal energy of a helium atom at the core of a star is 2.07 × 10–16 J. 13.8. Three vessels of equal capacity have gases at the same temperature and pressure. The first vessel contains neon (monatomic), the second contains chlorine (diatomic), and the third contains uranium hexafluoride (polyatomic). Do the vessels contain equal number of respective molecules? Is the root mean square speed of molecules the same in the three cases?  If not, in which case is vrms the largest? 13.9. 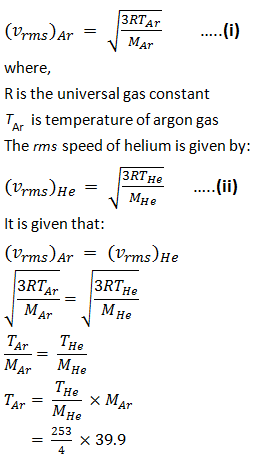 At what temperature is the root mean square speed of an atom in an argon gas cylinder equal to the rms speed of a helium gas atom at – 20 °C? (atomic mass of Ar = 39.9 u, of He = 4.0 u). Therefore, the temperature of the argon atom is 2.52 × 103 K.
13.10. Estimate the mean free path and collision frequency of a nitrogen molecule in a cylinder containing nitrogen at 2.0 atm and temperature 17 °C. Take the radius of a nitrogen molecule to be roughly 1.0 Å. Compare the collision time with the time the molecule moves freely between two successive collisions (Molecular mass of N2 = 28.0 u). 13.11. A metre long narrow bore held horizontally (and closed at one end) contains a 76 cm long mercury thread, which traps a 15 cm column of air. What happens if the tube is held vertically with the open end at the bottom? 13.12.  From a certain apparatus, the diffusion rate of hydrogen has an average value of 28.7 cm3 s–1. The diffusion of another gas under the same conditions is measured to have an average rate of 7.2 cm3 s–1. Identify the gas.